Does your onboarding look like an office directory? As a product scales the customer onboarding experience inevitably increases in complexity. The different teams responsible for different parts of the experience will inevitably optimize for their own success. But this just leads to increased complexity for the customer. We’ve previously explained how focusing on the customer will reveal a lot of low-hanging fruit in your product that will up your onboarding game. This low hanging fruit lies not just within the product but within your organization as well. You don’t have to look for long to find poor onboarding experiences. Many of the world’s best known consumer technology brands suffer from them. But don’t worry; it’s possible to structure your teams so they’re aligned to create the best experience. You can make your entire organization work for you to create an optimal customer onboarding flow. For example, we recently asked a number of teams at Intercom to reacquaint themselves with the experience of setting up a product. After all, even for those who have worked at Intercom for a while, it wasn’t a flow they were likely to remember a lot about. Viewing the onboarding experience with fresh eyes, I noticed how the transitions between certain parts were jarring, and in some cases, plain wrong. For one of our products, Acquire, customers were placed in the wrong part of Intercom once it was fully configured. When a customer installed a single Intercom product, the onboarding UI still referred to all Intercom products, even presenting install options that didn’t apply. If I could see these inaccuracies, it’s likely hundreds of customers had found them too. What struck me was that most of these mistakes were not down to design and engineering oversights. Instead, they exposed how different parts of the onboarding were handed off between our marketing, growth, and product teams. It was like reading an office directory – you could literally see the organizational structure of Intercom in our onboarding. The navigation for your product’s marketing website reflects the separate teams within the company. The visual style of your marketing site isn’t carried through to the setup and onboarding experience of your product. Customers are confused when moving from one stage of the flow to the next because the content and context doesn’t reflect where they just came from. There are multiple redirects between different parts of the onboarding flow. Customers arrive in your product and don’t know what to do. A customer doesn’t care if marketing owns the page before signup and product owns the page after signup. They only care about one thing – using your product successfully to produce an outcome they desire. This is easy when you’re a startup with 10 people in one room. Everyone is working towards the same roadmap and there’s little product collateral to maintain. “Push it live and get people to use it now” is the mantra. But as a startup grows, specific teams are created to deliver concentrated value – engineering, marketing, sales, product, etc. This allows teams to focus on specific problems more thoughtfully than an ad-hoc group can. Focus helps product teams solve more specific problems but it may not lead to coherent experiences overall. It can also lead to silos where your onboarding is a collection of disparate pieces that make little sense to your customers when placed together. Consider marketing landing pages, account creation, payment, initial product setup and finally, initial use of the product itself. When a startup begins to scale, focus dictates that many of these steps be owned by separate teams. Yet successful onboarding is a direct result of how effectively each of these teams work together – not how each team is able to optimize their own piece of the flow. It’s easy for teams to think within their own focus area, since they can more easily deliver a great result within their own domain. Creating the best experience relies on each of them working together to establish good continuity throughout the entire flow, particularly at these transition points. Periodically review the entire experience. 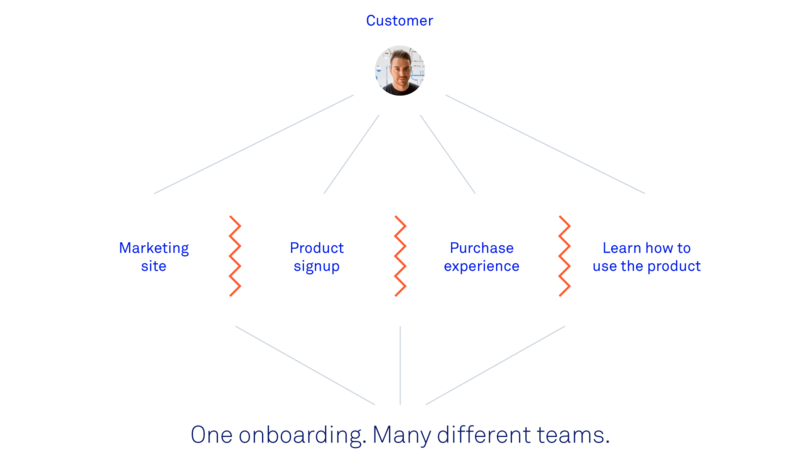 Each team responsible for a part of the onboarding flow should review the entire experience end-to-end. This is good for context, so there’s an awareness their part of the process needs to work well with the rest of it. It also helps reveal awkward transitions between different areas of ownership so they can be addressed. Assign one onboarding owner from each team. It’s critical organizational alignment is created where key people share responsibility for the onboarding flow. The more teams and owners that proliferate, the more silos occur. When you hear people deflecting responsibility, “Oh, you gotta talk to the growth team about that”, rather than, “Let’s work with the growth team on this together”, you know you have an issue. Organizational alignment creates a structure that increases the likelihood of success. Align each team behind a shared goal. 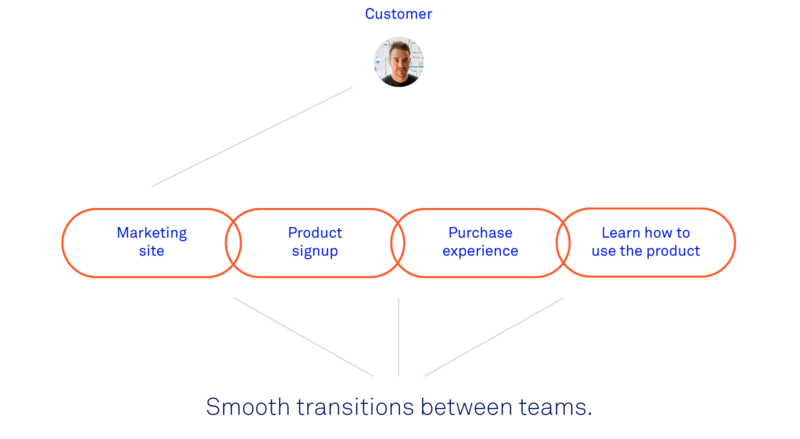 If one team’s goal is to educate the customer, and another’s is to get them through signup as quickly as possible, you can see how cracks in an onboarding flow might occur. Make sure each owner agrees with and works towards the same goal i.e. create the most intuitive, efficient and delightful onboarding experience that results in higher customer conversion. Enforce domain overlap. Most companies like to box off responsibilities for each team so they can focus on their specific problem. 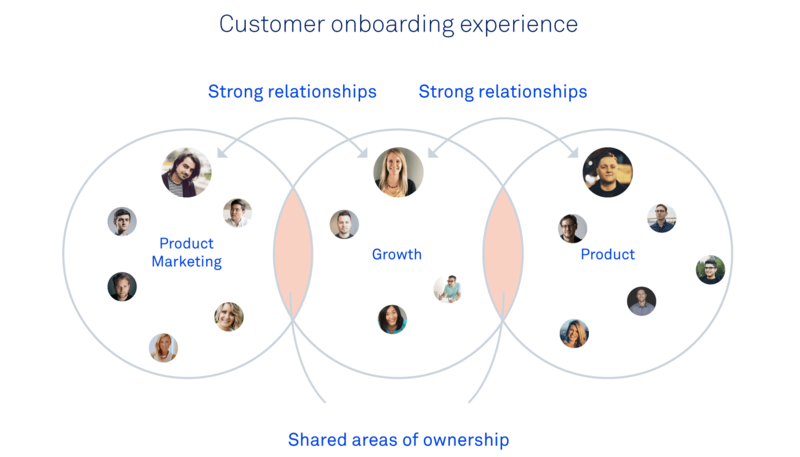 Onboarding doesn’t have that luxury – team overlaps need to be woven together. Instead of fighting these overlaps, iron them out so there’s a smooth transition. In our example, the marketing and growth teams might be responsible for the start of the signup flow and growth and product might be responsible for teaching the customer how to use the product once they buy it. By creating a shared responsibility at each transition point, we create a better model for a more fluid onboarding flow end-to-end. Your customers need the most attention right up until they see the value of your product. Successful onboarding isn’t simply getting your customers to pay; it’s proving the value of your product once they start using it. This means onboarding is one of the most important and complex product flows you will ever create. It also falls under the remit of several teams, increasing its complexity. We presented three ways – team alignment, goal alignment and domain overlap, to help your organization work for you. Get it right and your onboarding will be set up so that each team shares responsibility for creating the best experience possible. Use your organization to master your onboarding experience and you’ll not only end up with happy customers, but with a meaningful impact on your business.